Based on the 'Picture Post' exhibition of the same name, mounted at London's Festival Hall, 1956. Rise in smoke towards the sky? Will you see your children die? Men and women, stand together. Do not heed the men of war. Ban the bomb for evermore. Strikes at every race and creed. Murder folk in distant lands? Have his blood upon your hands? Shall we lay the world in ruin? Stnp and think of what you're doing. Time is short; we must be speedy. House the homeless, help the needy. Shall we blast, or shall we build ? Deadly the harvest of two atom bombs. Deadly the haryest of two atom bombs. Words and music by Koki Kinoshita. Song Of Hiroshima is an adaptation of the moving Japanese lament sung each year when the World Council against A- and H-bombs meets in Japan. It commemorates those who died—and those who, fifteen years later, are still dying—from the atom bombs on Hiroshima and Nagasaki. The music was arranged by the Youth Choir's patron Alan Bush; the words are [translated -ht] by Ewan MacColl. The Hammer Song was created by Lee Hays and Pete Seeger, of the famous American folksong quartet The Weavers. "I'd hammer out DANGER", says the song—the danger that our whole world may go the way of Hiroshima. The Family Of Man was composed by singer-guitarist Fred Dallas after seeing the famous exhibition of photographs of the same title. Fred has written many songs; this deservedly is one of the best-known and best-liked. The H-Bombs Thunder was written (by myself, as it happens) because a group of singers got together to decide what they would sing on the first Aldermaston March and wanted a special song to mark the event. The tune is traditional; a long time ago it belonged to a Welsh hymn. The roads between Aldermaston and London have echoed to this song. It has been sung by thousands in Trafalgar Square. A copy of it has been given to Prime Minister Diefenbaker of Canada. It has been published in America and people from all over Europe have taken it home with them after learning it on the Aldermaston Marches. THE LONDON YOUTH CHOIR is a phenomenon. The point isn't just that here's a group of young people who sing because they love singing ... and sing, very well, moreover. As anyone could tell you who's stood with them on rainswept street corners, or had a new spring put in his step by their songs while marching beside them on the road from Aldermaston—these people mean it. They sing not just with their voices, but with their hearts. Join in! The world should be singing like this! The words and music of these songs have appeared in the magazine SING (12a Chichele Mansions, Chichele Road, London, N.W.2). 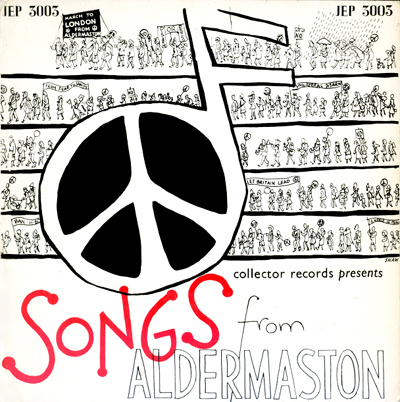 The words of these and many other SONGS FROM ALDERMASTON are to be found in the booklet of the same title published by John Foreman, 15 Mortimer Terrace, Highgate Road, London, N.W.5. REPRODUCTION IN WHOLE OR IN PART OF THIS RECORDED WORK OR ITS NOTES WITHOUT PERMISSION STRICTLY PROHIBITED. 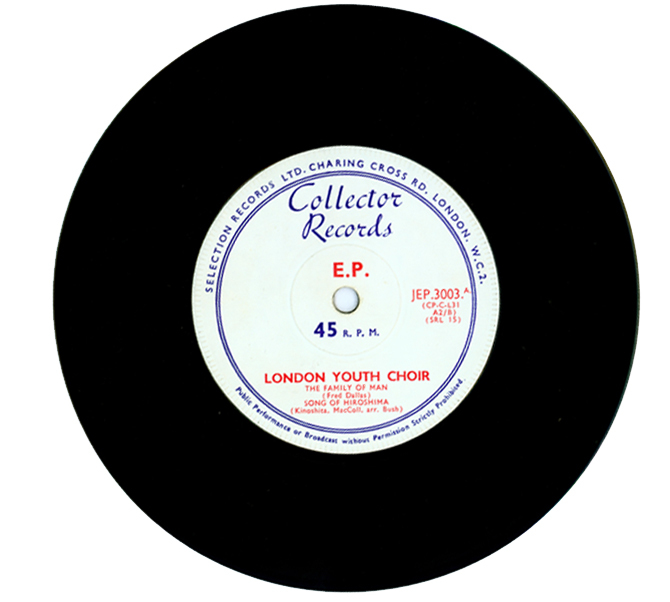 PRODUCED BY SELECTION RECORDS LIMITED, 100 CHARING CROSS ROAD, LONDON, W.C.2. Published 2010 with permission from the Campaign for Nuclear Disarmament, London. Related songs: Ian Campbell: The Sun is Burning. Recorded on The Sun is burning – The Songs of Ian Campbell, the Ian Campbell Folk Group, 1971. Argo ZFB 13. Song note: 'This was probably the first lyric anti-war song to achieve popularity and wide circulation in the British CND movement. The demonstrators marched to the strains of The H Bombs Thunder, but when circumstances called for something less rousing and more introspective this, I am proud to say, was the song that in the early days often met the need. It was written for Lorna and she has made it uniquely her own'. First release as the single The Crow and the Cradle, 1963. Also recorded by Simon & Garfunkel on Wednesday Morning, 3 A.M., 1964 and as well by others.